This MA-1 flight jacket is made of a 100% nylon outer shell with polyester fiber fill in the body and sleeves. It has two front slash pockets, one zippered utility pocket on sleeve, knit collar - cuff - waistband, heavy duty zippers, reversible to orange for emergencies and with SECURITY on front and back. 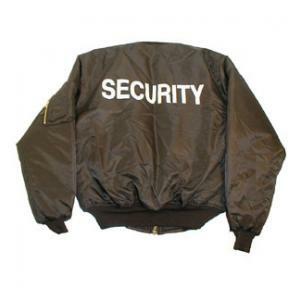 This jacket comes in black only.